Currently displaying all 803 items in the archive. Enter a search term or click on a filter. 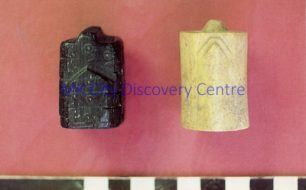 Postcard showing two medieval chess pieces from excavations in Milton Keynes, one of jet and one of bone. 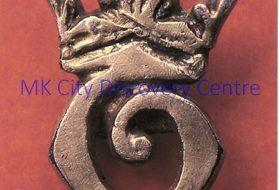 Postcard showing a medieval silver gilt pilgrim's badge. The design, a crowned T, is thought to represent St. Thomas of Canterbury. View of the farmhouse at Bradwell Abbey with tables and benches on the grass outside. 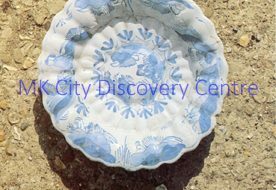 Postcard showing a 17th century fluted Delft bowl from excavation at Bradwell Abbey. Bowl is light blue and white and positioned on a dirt and stone floor. 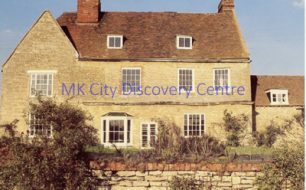 Postcard showing an external view of the front and side of Milton Keynes Youth Hostel at Manor Farm, Bradwell. Print of a drawing of The Rectory at Milton Keynes Village by Barbara Hilliam. 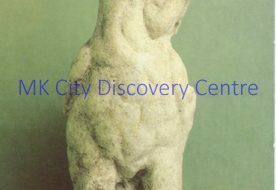 Postcard of a marble cockerel from a larger statue, probably depicting the god Mercury, from the excavations at Bradwell (now Bancroft) Roman Villa. 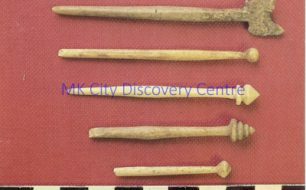 Postcard showing five Roman bone pins with decorative heads, from the excavations at Bradwell (now Bancroft) Roman Villa. 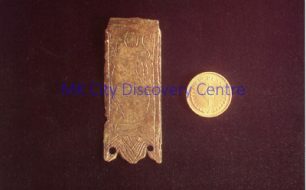 Postcard showing a medieval bronze strap end with decoration depicting a dragon, from the Woughton medieval village excavation, next to a new halfpenny coin for scale. 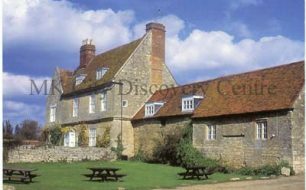 Postcard of an external view of Bradwell Abbey Field Centre (the farmhouse), Bradwell Abbey. 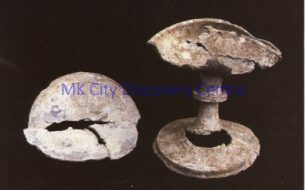 Postcard showing thirteenth century pewter chalice and paten from priest's burial excavated in Great Linford Churchyard. 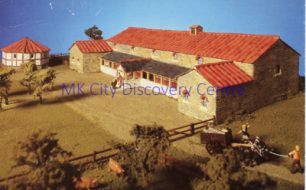 Postcard showing model of how Bancroft Roman Villa would have looked. 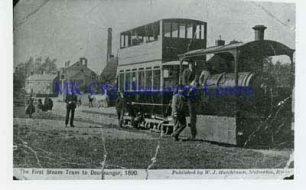 Postcard showing a steam tram awaiting departure on Wolverton Road, Stony Stratford. A man is stood beside the engine and people are looking out of the top deck windows. The tram stands in front of North Bucks Trading Company building. 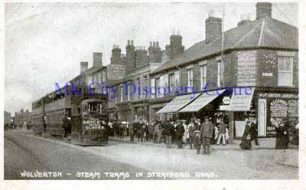 Postcard entitled "Wolverton - Steam Trams in Stratford Road". Shows a steam tram on the road outside buildings, with a large group of people on the path in between. Postcard showing a view of Nevells Road, Letchworth, c1905. Three men are working a field in the foreground and there are houses in the background. Postcard showing a group of children and horse and carriage on Station Road, [Letchworth]. The Garden City Hotel is on the left of the image.